ROCHESTER, N.Y. (CNS) — When they awoke Feb. 20, 1967, Father George Weinmann and Sister Lilian Marie McLaughlin did not know that by early afternoon they’d perform actions that would cost them their lives — and render them modern-day martyrs in the eyes of many. Yet when danger stared them down, in the form of a fire spreading through St. Philip Neri Church, they responded as only people with great faith might. 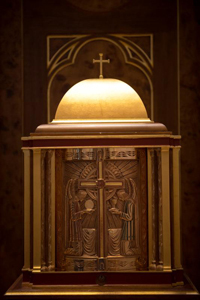 Father Weinmann, the pastor, rushed into the burning building to save the Blessed Sacrament inside the tabernacle. Sister McLaughlin, a School Sister of Notre Dame, who was a teacher at the parish school, soon followed to assist him. Neither made it out. Sister McLaughlin, who had turned 26 just two days earlier, died on that Monday afternoon. Father Weinmann, 77, lost his life two days later. Fifty years after the fact, the profundity of their heroic deeds is still felt deeply, as evidenced by the overflow crowd at the Church of the Annunciation Feb. 26 for a 50th anniversary memorial Mass celebrated by Rochester Bishop Salvatore R. Matano. 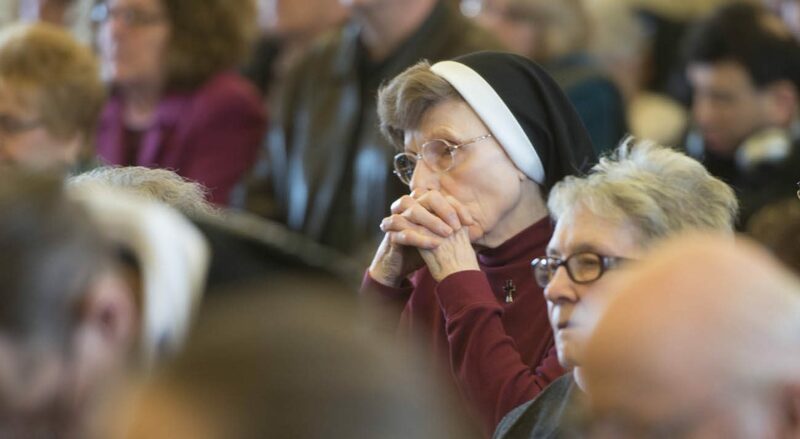 Among the attendees were family members of both Father Weinmann and Sister McLaughlin, as well as parishioners of the former St. Philip Neri Parish. The homilist, Father Dennis Bonsignore, said the priest and nun provided a stirring example of their belief in the real presence of Christ in the Eucharist. Sister McLaughlin’s brother, Jim, who traveled from his home in Los Angeles for the memorial Mass, said he wasn’t surprised that his sister was brave enough to defy the common safety logic of getting away from a fire. “There are few people who would go toward it. She was one of them,” he told the Catholic Courier, Rochester’s diocesan newspaper. Bishop Matano told the congregation that Father Weinmann and Sister McLaughlin are models for all Catholics to follow in giving fully of themselves to Jesus. “We pray that in imitation of Sister Lilian Marie and Father George Weinmann we can say, ‘It is no longer I who live, but Christ who lives in me,'” Bishop Matano said, quoting Chapter 2, Verse 20, of St. Paul’s Letter to the Galatians. During his homily, Father Bonsignore noted he had acknowledged the St. Philip Neri fire on the 25th anniversary, in 1992, while serving at Irondequoit’s St. Cecilia Parish. On that day, he said, Peter Fantigrossi happened to be present not knowing that Father Bonsignore would be preaching about the fire. Fantigrossi was the firefighter who carried Sister McLaughlin out of St. Philip Neri. The incident had left him so distraught that he fell away from church for many years. At a reception following the Feb. 26 memorial Mass, Jim McLaughlin and his sister, Evelyn McLaughlin Sabino, met several members of the Fantigrossi family for the first time. Latona is a staff writer at the Catholic Courier, newspaper of the Diocese of Rochester.